Our new designer line, is available in three different widths, 5'' (joey), 8 1/2" (jill), and 11'' (jack), all measuring 3'' tall. Easy to use and affordable, they are perfect for growing succulents, small house plants and herbs. Besides using them for gardening needs they also display well on desks, coffee tables, restaurant tables, store displays and more. The porous material allows the plants to breath, and the containers come in three decor friendly colors: Navy Blue, Forest Green and Heather Grey. ​It is recommended if planting indoors to place on a tray, as the pots are made of a porous material and water will come through. Entrapment pruning prevents roots from penetrating fabric and does not prune by air, allowing for pot-in-pot use. When used above ground roots are still pruned. What are Root Pouch Boxer Pots made of? Root Pouch degradable plant pots are made of PET derived from recycled plastic water bottles. This material is melted back to a sterile liquid state then spun into fibers. Because the plastic is re-melted it is once again sterile making it a great choice for growing plants for human consumption. Root Pouch does not use new petroleum as some other fabric companies do. So Root Pouch does not contain any toxins and It is BPA free and UV resistant. The root Pouch black line is the most durable semi-degradable root pouch available. Root Pouch is the only fabric container company that offers natural fiber blended fabrics. When used In-ground the natural fibers draw water from surrounding soil. When used for pot-in-pot the pouches prevent roots from penetrating fabric because it prunes by entrapment rather than air pruning. When used above ground roots are still pruned. Black 3-4 year Fabric is available in approximate sizes from 1 gallon to 600 gallon, with and with out handles. 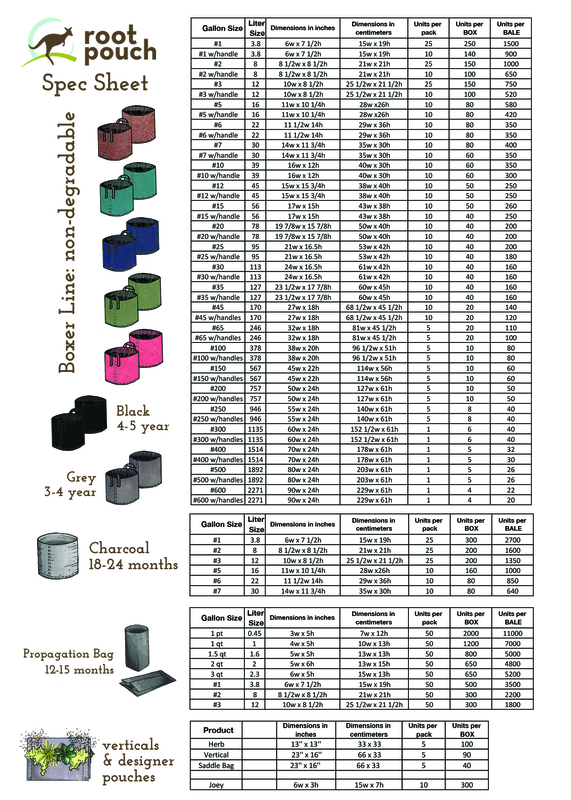 Click below for a printable version of the Root Pouch products Spec Sheet. Charcoal fabric is available from 1 gallon to 5 gallon without handles. Click below for a printable version of the Root Pouch products Spec Sheet. The thin black is great for propagation. The bag forms a square bottom ideal for trays and when turned inside out it forms a round bottom like traditional pots. Our Thin Black Fabric is available from 1 pint to 3 gallons, no handles. Click below for a printable version of the Root Pouch products Spec Sheet. Why is Root Pouch Thin Black the best choice for propagation? Air pruning fabrics allow the root to squeeze through the fabric. Root Pouch traps the root tips in the fabric creating dense fibrous root systems while containing the roots within the bag. Replacement for standard plastic poly grow bags. Breaks down in 12-15 months when there is soil on BOTH sides. Note, when you are planting the tree or plant in the ground permanently, please remove the pouch. Replacement for the standard plastic poly grow bags. Our fabric grow bag is available from 1 pint to 3 gallons, with out handles. Click below for a printable version of the Root Pouch products Spec Sheet. The Hedge Pouch makes a fantastic item that can be sold to Garden Centers empty to sell retail to customers that take home and plant up gardens, border plants, flowers, and create their own patio and walkway accent plantings. The commercial shrubbery and flower growers love them because it opens up a whole new industry of instant hedges and a new way to sell shrubs and flowers. These pouches can be potted and grown above ground with normal container yard growing techniques. For growers that wish to grow their shrubs in the ground with the pouch (open ground field growers), They can use our grey semi-degradable pouch grow right in the ground dig and ship. The customer then only need dig a trench and pot Pouch and all. ​A new product from Root Pouch, this shrub pouch is perfect for creating instant hedge walls. Other uses: Bamboo, rose gardens, flower beds, etc. What is the difference of Root Pouch b&b fabric vs traditional burlap? Burlap has been around since the 17thcentury and is still an adequate economical way to wrap a root ball for very short periods of time providing great care is given to watering and protection from the elements. Our Root Pouch b&b fabric wraps act as a protective membrane around the root ball and are strong enough to last well into the next season. It is breathable, absorbent and will allow water to reach the root ball and not shed off as with burlap. It will protect the root ball from heat exposure, direct sun damage to root tips and even protect the roots from winter cold. What is the Root Pouch b&b fabric? Root Pouch has developed a strong lightweight 150g/m2 natural fiber blend as a root wrap for trees and shrubs. It’s advantages are especially noticed after trees are being held longer than 3-4 months. 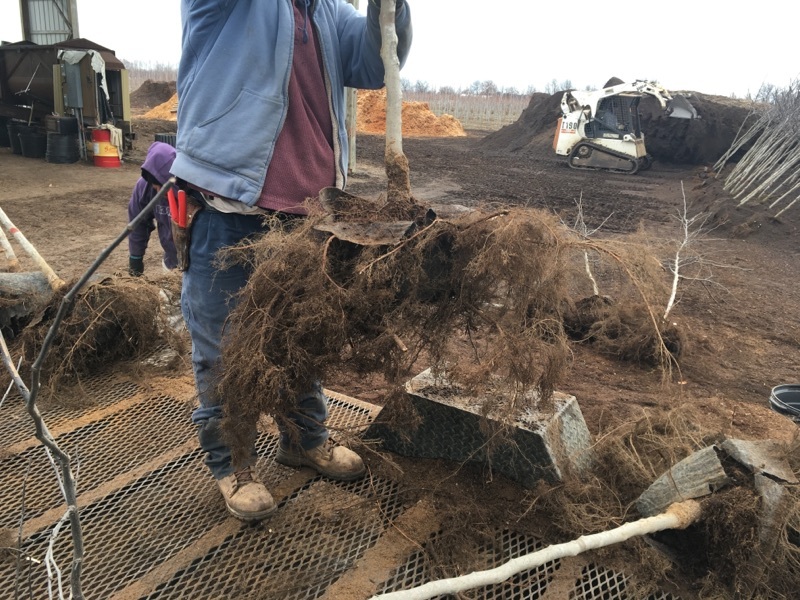 Growers typically are anticipating the trees will be purchased and transplanted, but when this is not the case, then the dug tree can live a long and healthy life in the Root Pouch b&b fabric. What are the benefits of using the Root Pouch b&b fabric? Normally field digging is limited to spring and fall, during this time growers face the challenge of anticipating which and how many units they should dig and project how many will sell. Always trying to project sales any unsold dug trees have to go through summer heat or winter cold and this makes holding the trees more than just difficult. An advantage to this fabric versus burlap is watering the trees. Overheads work great with this fabric, water that hits the outside of burlap sheds off whereas the natural fibers in the fabric absorb the water allowing it to reach the root ball. Growers can now with confidence harvest trees, ball and Root Pouch them knowing that with proper maintenance they can be held in a healthy viable condition for seasons not just months.